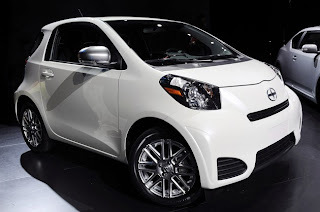 In what is quite an unexpected promotion and one that is not really likely to drum up excitement for the Toyota Scion iQ or the PlayStation Vita, Toyota is now giving customers who buy the world’s smallest four seater a free Vita as soon as they close the sale. It’s part of a growing partnership between Toyota and Sony, one that is probably more about getting in-dealer presence than it is about the actual promotions involved. In an effort to tie the promotion together and try to have it make sense, Toyota’s Scion vice president Jack Hollis said, “Scion is very proud of the iQ’s intelligent and functional design. Similar to the PS Vita, the Scion iQ comes loaded with premium technological features, has a focus on functionality, is concentrated into a suitably small package and most importantly is tons of fun.” The company also noted that the Scion iQ is a selectable car in the game MotorStorm RC. “The iQ is a small car that offers the functionality and comfort that drivers expect from a car twice its size. The iQ comes standard with 11 airbags and features an impressive EPA rating of 37 miles per gallon on regular unleaded gas,” Toyota boasted. The manufacturer’s suggested retail price for the iQ is $15,265. So getting a free Vita is a reward worth 1.6% the value of your purchase. It probably won’t make any logical car buyer tip the scales in the direction of the iQ. What company do Sony need to partner with to increase PS Vita sales? Let us know in the comments below!